A disciplined investment planning process is critical to long-term investment success. There are a slew of financial products that can baffle even the most astute financial practitioners. To us, simplicity defeats complexity. If we 1) cannot understand it and/ or 2) cannot explain it in a matter that you understand it, then you should not be investing in it. As Warren Buffet once said, "Never invest in a business you cannot understand." Investments should be diversified across asset classes, markets and strategies. 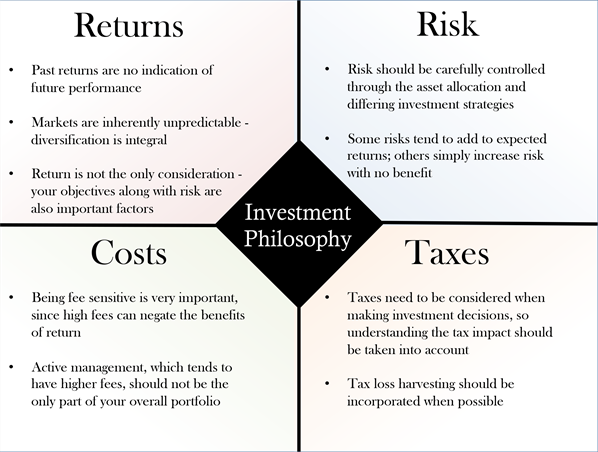 Investment planning must take into account a proactive tax strategy, as it is not necessarily what you earn but what you keep. A long-term approach allows us to take advantage of mispriced investments. As life evolves, so should your investment plan. We find it critical to reassess your financial plan along the way, incorporating new goals and lifestyle changes. It is not our position to offer legal or tax advice. We encourage you to seek the advice of an attorney or accountant prior to making tax-related investment and/or insurance decisions. Diversification may help reduce, but cannot eliminate, risk of investment losses.